Notes: During the transition from Service Numbers to Social Security #s both were sometimes displayed. Notes: If name is too long, initial first name. Gas Mask Sizes are XS,S,M,L,XL. USMC Service numbers have ranged from 5-7 digits. Religion was spelled out. MilitaryVetsPX.com Military Dog Tags are the same stainless steel ID Tags used by the United States Military during the Post Vietnam War, the Gulf War, and are still used today. They come the same way they were issued to you in the military; you get two stamped tags, a long chain and a short chain. 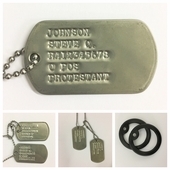 Dog Tags also make excellent Medical ID Tags or Medical Identification tags, Medical Alert Tags, Diabetic ID Tags, Luggage ID Tags, Pet ID Tags, Cat ID Tags and Dog ID Tags.